Berlin, Germany has definitely seen its share of hard times, but after centuries of struggle and oppression, the city is finally coming in to its own once again. The birth of Berlin took place over 800 years ago when the two towns of Berlin and Coelln merged to create one city. About 400 years later in 1709, Frederick William I, the infamous �soldier king� of Prussia, continued to merge surrounding towns with Berlin and called the city home. Berlin�s love affair with the arts began around this time with the philosopher Voltaire visiting the king�s court and museums and opera houses popping up all over the city. 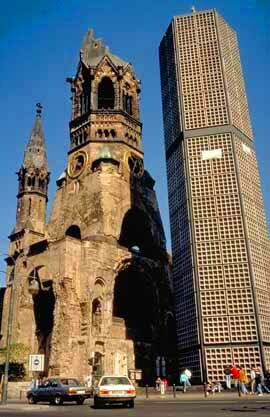 Berlin�s cultural and industrial progression became suffocated as early as the first World War. When Hitler got his hands on Germany, Berlin really began to fall apart. Over half of Berlin�s Jewish community did not survive the Holocaust and even more were forced to flee their country, families and homes. Following the second World War, Berlin was divided in half by the Allied forces. The German Democratic Republic made Eastern Berlin its capital. 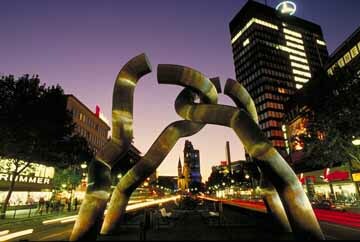 This is the part of Berlin that would come to be associated with Communism and oppression until the late 1980�s. A wall was built in 1961, physically dividing the city and as a means for preventing East Berliners from escaping to the other side. Since the Wall came down in 1989, the city of Berlin has made long strides towards reunification and the city has once again become one of the cultural epicenters of Europe. There are numerous ways to soak up the capital of Germany. If time in Berlin is limited, an organized bus tour is the way to go. This way, visitors to the city can see the main tourist sights in a relatively short period of time, as these tours run approximately two hours long. For those who prefer to branch out on their own and take their time, a leisurely walk through Berlin is ideal. A good place to start is either at the eastern side�s city center or the western side�s. During the warmer months of the year, hundreds of tourists can be seen biking around the city. Berlin is very bike friendly with cycle paths being abundant. Berlin is absolutely exploding with museums; there is even a Museum Island. 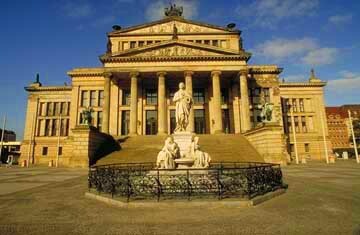 Museum Island is home to several cultural attractions including the Bodemuseum, the Altes Museum, the Pergamon Museum and the Nationalgalerie. The Pergamon Museum allows visitors to catch a glimpse of the ancient world via various artifacts such as the Pergamon Altar of Zeus and the Ishtar Gate from Babylon, which dates back to 180 BC. 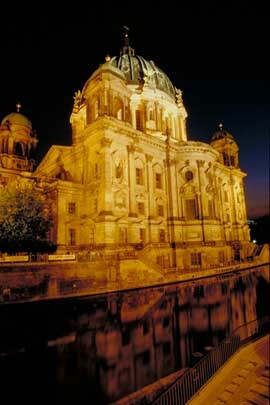 Also located on Museum Island, the Berliner Dom is the 200-year-old church of the Hohenzollern family. The remains of almost 100 family members are in the church�s vaults. The Jewish Museum Berlin documents the community�s turbulent and tragic relationship with the city as well as the country. The Nazi�s destroyed the original museum. Various forms of expression include painting and sculpture. The Beate Uhse Erotik-Museum is considered one of the top five museums in the entire world by attendance. Germany experienced an Expressionist movement in the beginning of the twentieth century, known as �The Bridge�. The Brucke Museum pays homage to the works of this generation of Berlin and Dresden artists. To enjoy a breath-taking view of Berlin, tourists should climb the 285 steps to the top of Victory Column, which was built as a testament to Prussia�s military achievements. The Reichstag, after a vast restoration project, is once again home to the German Parliament. Since its construction over 100 years ago, this building has undergone many changes. In 1995, the controversial artist Christo and his wife wrapped the building in typical Christo fashion. The Allied Museum provides visitors with a look into how the Allied troops contributed to the demise of Hitler�s regime. It is hard to think of Berlin without thinking of the Berlin Wall, a structure that caused immense pain and suffering for thousands of people over a span of almost 30 years. A barricade between the Eastern and Western parts of Berlin was constructed in August of 1961 using barbed wire and antitank obstacles. From then on out, those inhabiting East Berlin were permitted from entering West Berlin even if an individual had family or a job on the other side. Once the Wall was finally constructed, the border separating the two factions of the city ran 166 km. Those who tried to escape were immediately shot on sight with over 100 people killed for attempting such a feat. When the Wall finally came down in 1989, the entire world watched as Berliners celebrated and hammered parts of the Wall down. Today, only small parts of the wall remain standing, symbolizing the triumph of democracy over repression. The Charlie Checkpoint Museum documents the history of the Berlin Wall. 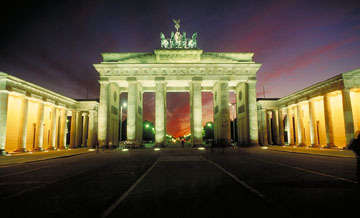 Standing in the center of Berlin is the Brandenburg Gate, which was built prior to the Wall�s construction. Upon construction of the Wall, the gate was embedded in the Wall. Today, the gate symbolizes its original intention, peace. Copyright © 1997-2003 Analytical Software Packages, Inc.